Efforts to curb carbon emissions via government automobile regulation means that ultra-low emission vehicles, including pure electric vehicles (EVs) and plug-in hybrids, will play an increasing role in the way we travel. In California, for instance, by the 2025 model year, 15.4% of projected statewide sales of 1.75 million cars and light trucks sold by automakers will have to be zero emission vehicles (ZEVs). California will not be alone. Federal law permits other states to adopt California’s automotive emissions rules if they are stricter than federal regulations (and they are, since there is at present no federal ZEV mandate). As a result, nine other states and the District of Columbia say they will follow California and institute their own ZEV requirements. However, among the current obstacles to widespread adoption of EVs are their long charging times and lack of available charging stations. Currently, the most common EV or hybrid EV power transfer system is the plug-in electric charger. These usually charge at between 3 kilowatts (kW) and 50kW (some, like the Tesla supercharger, can go up to 120kW) while the vehicle is stationary and switched off. This solution is adequate for charging at home or in parking garages since the vehicle must spend considerable time standing still. However, what if the EV charging infrastructure could be extended via the application of inductive power transfer to the vehicle during driving? The concept is called Dynamic Wireless Power Transfer (DWPT) and studies have shown that introducing DWPT on roadways would increase the likelihood of consumers using an EV as their main car. The technology would address driver concerns about restricted driving range and the possibility of running out of power between charging stations. Overview of the wireless inductive power transfer pads embedded underneath the roadway at Utah State University’s test track. Image source: Utah State University. The notion that resonance could be used to improve wireless power transmission is well known. In 1894, Nikola Tesla was granted a patent for a resonant inductive coupling to supply electric current to the motors of streetcars from a stationary source. He proposed doing so without the use of contacts between the line conductor and the car motor. The principle of wireless power transfer is simple; it is an open-core transformer consisting of primary transmitter and secondary receiver coils and associated electronics. Charge-as-you-drive technologies have already been pioneered in several places. 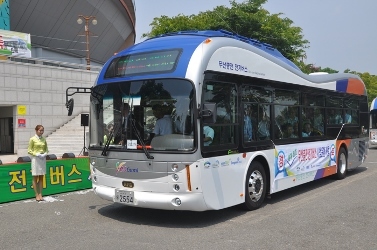 In South Korea, the Korea Advanced Institute of Science and Technology (KAIST) has developed a wireless power transfer technology called OLEV, short for On-Line Electric Vehicles. It works using technology embedded beneath the road. In the town of Gumi, a route has been built that allows buses to recharge while in motion. The technology supplies 60 kHz and 180 kW of power wirelessly to the transport vehicles. The route length is 35km, and the length of the DWPT section is 144m, comprised of four DWPT sections. Two buses are equipped to recharge while driving over this roadway; the OLEV buses have coils on their underside to pick up power through the electromagnetic field on the road. The DWPT system enables the buses to reduce the size of the reserve battery used to one-fifth that of the battery on board a typical electric car. Bombardier, a leading manufacturer of planes and trains, has developed a charging system for trams called PRIMOVE. The technology allows vehicles to run continuously without overhead lines. A research project undertaken by Flanders DRIVE, a research organization supported by the Flemish government, allowed Bombardier to test its inductive charging technology on road-based vehicles using a test track built on a public road. During a feasibility study in Lomel, Belgium, between 2011 and 2013, a bus was retrofitted with the first-generation PRIMOVE system. Two buses are equipped to recharge while driving over this roadway; the OLEV buses have coils on their underside to pick up power through the electromagnetic field on the road. Fitting the bus with PRIMOVE charging equipment designed for a maximum energy transfer of 160kW proved the technical feasibility of high-power Two buses are equipped to recharge while driving over this roadway; the OLEV buses have coils on their underside to pick up power through the electromagnetic field on the road. inductive energy transfer for electric buses both while parked (static charging) and while moving (dynamic charging). Bombardier is currently implementing a 200kW system for electric buses in Bruges, Belgium as well as in Braunschweig, Mannheim and Berlin in Germany. On the automotive side, the PRIMOVE team reports that it can offer its technology at three levels of charging power: 3.6kW, 7.2kW and 22kW. Meanwhile in the United States, Utah State University has built an EV, roadway research facility and test track that uses wireless inductive power transfer pads embedded underneath the roadway. The installation allows EVs to charge while they are in motion. The facility, called EVR (for electric vehicle and roadway) has capacity for 750 kW of power with AC-to-track and DC-to-track provisions. Construction of the test track and lab building is complete with equipment, including a dynamometer for testing vehicle capabilities in place. Utah State’s EVR should be fully operational in the fall of 2015. One of the most ambitious trials may be in the UK where the government agency Highways England has announced plans to carry out test track trials of a wireless road-embedded EV charging technology. The trials will involve fitting vehicles with wireless technology and testing the equipment installed underneath the road. The trials are expected to last for approximately 18 months and, subject to the results, could be followed by tests on existing motorways. Additional details of the trials will be made available when a successful contractor has been appointed. Individual power transfer segments up to 8m in length would be combined into power transfer sections of up to 50m long (consisting of four segments with gaps between each segment). Up to two segments can be energized in any given 50m section. Power transfer was set up to 40kW for light vehicles and up to 100kW for buses, trucks or other heavy-duty vehicles. Each 50m segment could supply two vehicles with power. Individual power transfer segments would be created up to 40m long. A gap of around 5m would be placed between adjacent segments. Each 40m segment could supply power to one vehicle. Power transfer was limited to 40kW for light vehicles and to 140kW for buses or trucks. 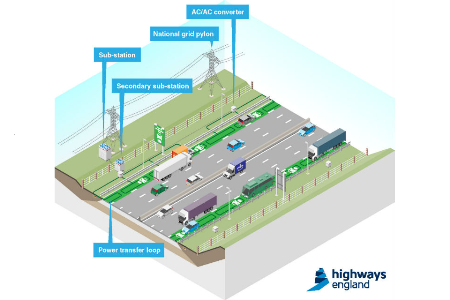 The Highways England analysis showed that under different traffic conditions—and using an assumed scenario for vehicle and technology penetration—average demand could be as high as 500kVA (0.5MVA) per mile. When use of the system fell short of the maximum value, the expected demand was found to be similar across both layouts. The number and length of segments under these conditions would not have an impact on total power demand, the study showed, as the number of power transfer segments that can be occupied is limited by the number of vehicles on the road. Power demand from the second layout example was found to be slightly higher than from the first example due to the higher power transfer capability for heavy-duty vehicles. While the study concluded that systems with shorter coil lengths (up to 10m) are likely to be safer and better able to cope with higher utilization, different coil lengths will be investigated during the trials to understand the variability and implications on safety. Highway England also considered three types of road construction for DWPT, including trench-based constructions (where a trench is excavated in the roadway for installation of the DWPT primary coils), full-lane reconstruction (where the full depth of roadway is removed, the primary coils installed and the lane is resurfaced), and full-lane pre-fabricated construction (where the full roadway is removed and replaced by pre-fabricated full-lane width sections containing the complete in-road system). Both of the first two methods were found to be viable. The study concluded that the full lane pre-fabricated method is likely to be prohibitively expensive, although further investigation is required as this is a relatively new construction technique. The upcoming trials are expected to offer more data for all three proposed construction methods. ExxonMobil has long known that burning fossil fuels causes climate change, yet has continued to fund groups that deny its existence. According to The Guardian’s Dana Nuccitelli, Exxon’s actions parallel how the tobacco industry deliberately deceived the public about the health risks of smoking. The connection between the tobacco industry and climate denial has been made before by those who have noted that many of the people and organizations working against climate action previously worked on behalf of the tobacco industry, and that both industries have used similar deceptive tactics to cast doubt on settled science. The Heartland Institute, for one, has received over $700,000 in funding from ExxonMobil and has previously denied the health dangers of tobacco and secondhand smoke. Is the fossil fuel industry, like the tobacco industry, guilty of racketeering? ExxonMobil has become infamous for its secretive anti-climate science campaign, having spent $30 million funding groups denying the scientific evidence and consensus on human-caused global warming. Last week, after an eight-month investigation, InsideClimate News revealed that from the late-1970s to the mid-1980s, scientists at Exxon were in fact at the cutting edge of climate science research. It’s ironic that 33 years ago, the world’s largest oil company accepted and concurred with the scientific consensus on human-caused global warming that many people continue to deny to this day. In another internal company document in November 1982, Exxon scientists illustrated the rapid global warming they expected to occur over the following century due to rising carbon pollution from burning fossil fuels. A year earlier, Exxon scientists were discussing the distinct possibility that the consequences of climate change could become catastrophic in the near future. In 1999, the Justice Department filed a civil Racketeer Influenced and Corrupt Organizations Act (RICO) lawsuit against the major tobacco companies and their associated industry groups. In 2006, US District Court Judge Gladys Kessler ruled that the tobacco industry’s campaign to “maximize industry profits by preserving and expanding the market for cigarettes through a scheme to deceive the public” about the health hazards of smoking amounted to a racketeering enterprise. Indeed, as the InsideClimate News investigation subsequently revealed, Exxon’s own scientists were warning of the dangers of human-caused climate change nearly 40 years ago. The parallels to the tobacco industry’s public deception are striking. It appears that many climate scientists have become fed up, and are encouraging the government to embark on a similar RICO investigation into fossil fuel industry efforts to mislead the public. Chancellor George Osborne has announced that the UK will guarantee a £2bn deal under which China will invest in the Hinkley Point nuclear power station. Mr Osborne, who is in China, said the deal would pave the way for a final investment decision on the delayed project by French energy company EDF. He said it would also enable greater collaboration between Britain and China on the construction of nuclear plants. Reports suggest one such reactor could be built at Bradwell-on-Sea in Essex. Energy Secretary Amber Rudd told the Financial Times she wanted Beijing to take the lead in developing new nuclear plants in Britain. She said China was expected to lead the construction of a Beijing-designed nuclear station at the Essex site. EDF welcomed news of the government guarantee, but did not say if it put the project back on track. Earlier this month, EDF admitted the Hinkley project in Somerset, which was intended to allow the plant to generate power by 2023, would be delayed. In February, the firm announced that it had pushed back its decision on whether to invest in the plant. It cannot afford the estimated £24.5bn cost of the plant on its own, so has been looking for financial partners to invest, particularly in China. This has proved difficult, which is why the government has had to step in to guarantee part of the cost. The new power station would be Britain’s first new nuclear plant for 20 years and is expected to provide power for about 60 years. He also announced a new £50m joint research centre for nuclear energy. Nuclear power plants are mind-bogglingly expensive to build. In China, relatively cheap labour means they typically cost between £6bn-£10bn, with the state-controlled economy providing the necessary regulatory and financial support. But in the free markets of the West, they cost many times more. No private company can afford this amount of money, particularly given it will be almost 10 years before the plant is operational and can begin generating a cash return. This is why governments have to get involved, providing subsidies of one sort or another. Hence George Osborne’s announcement. The government has already guaranteed EDF a price – many would argue a very high price – for the electricity it generates at Hinkley, and now it is enticing the Chinese with investment guarantees. Nuclear power: Energy for the future or relic of the past? Mr Osborne said Chinese companies would receive a substantial stake in the project, with the UK government acting as guarantor for the investment. The guarantee will be provided by the government’s Infrastructure UK Scheme, which provides finance for projects that have had difficulties raising money from private investors. Ms Rudd told the BBC that nuclear power played an important part in Britain’s energy security. “We want low-carbon electricity and if we’re going to hit our ambitious [emissions reduction] targets then we have to have nuclear,” she added. What is most striking about George Osborne’s Chinese tour is he is doubling his political and economic bet on the world’s number two economy at a time when that economy is looking its most fragile for 30 years. Today’s manifestation of the China bet is confirmation of a long-trailed loan guarantee – initially worth £2bn but likely to rise substantially – to bind in Chinese and French nuclear giants to their promised massive £24.5bn investment in the Hinkley Point C new nuclear plant. This is certainly long-term strategic planning for more power security by Osborne and the government (well they would say). With oil fluctuating at between $40 and $50 a barrel, Hinkley’s prospective electricity looks scarily expensive. The government has said Hinkley will provide up to 7% of Britain’s electricity needs from 2023. EDF, which will continue to control the venture, has agreed to provide electricity from Hinkley at a guaranteed minimum price of £89.50 per MW/hr for 35 years. 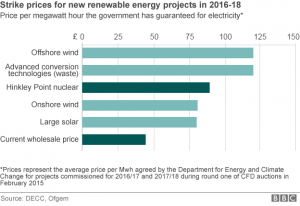 Renewable energy technologies have been given a guaranteed price for 15 years. Ms Rudd rejected criticisms that this was too expensive, saying nuclear power was “reasonably priced” compared with other low carbon sources of power.Vincent de Rivaz, chief executive of EDF Energy, said the chancellor’s announcement was “further progress towards a final investment decision” on the plant. He said: “The chancellor’s approval of the infrastructure guarantee is a clear sign of the government’s commitment to Hinkley Point C. The government’s determination to bring about a renewal of infrastructure and to attract inward investment to the UK are demonstrated by this good news. But Greenpeace’s chief scientist Dr Doug Parr described the £2bn guarantee from George Osborne as “signing up the country for the ultimate rip-off deal”. Other critics have raised concerns about the design of the new reactor, which will use new so-called EPR technology. Similar reactors being built in France and Finland are both late and way over budget. The union Unite welcomed the government’s commitment to non-carbon nuclear power, but it said it should not allow China to build a plant in the UK, describing its nuclear technology as “unproven”. Top executives were warned of possible catastrophe from greenhouse effect, then led efforts to block solutions. At a meeting in Exxon Corporation’s headquarters, a senior company scientist named James F. Black addressed an audience of powerful oilmen. Speaking without a text as he flipped through detailed slides, Black delivered a sobering message: carbon dioxide from the world’s use of fossil fuels would warm the planet and could eventually endanger humanity. “In the first place, there is general scientific agreement that the most likely manner in which mankind is influencing the global climate is through carbon dioxide release from the burning of fossil fuels,” Black  told Exxon’s Management Committee, according to a written version he recorded later. It was July 1977 when Exxon’s leaders received this blunt assessment, well before most of the world had heard of the looming climate crisis. A year later, Black, a top technical expert in Exxon’s Research & Engineering division, took an updated version of his presentation to a broader audience. He warned Exxon scientists and managers that independent researchers estimated a doubling of the carbon dioxide (CO2) concentration in the atmosphere would increase average global temperatures by 2 to 3 degrees Celsius (4 to 5 degrees Fahrenheit), and as much as 10 degrees Celsius (18 degrees Fahrenheit) at the poles. Rainfall might get heavier in some regions, and other places might turn to desert. “Some countries would benefit but others would have their agricultural output reduced or destroyed,” Black said, in the written summary of his 1978 talk. Exxon responded swiftly. Within months the company launched its own extraordinary research into carbon dioxide from fossil fuels and its impact on the earth. Exxon’s ambitious program included both empirical CO2 sampling and rigorous climate modeling. It assembled a brain trust that would spend more than a decade deepening the company’s understanding of an environmental problem that posed an existential threat to the oil business. Then, toward the end of the 1980s, Exxon curtailed its carbon dioxide research. In the decades that followed, Exxon worked instead at the forefront of climate denial. It put its muscle behind efforts to manufacture doubt about the reality of global warming its own scientists had once confirmed. It lobbied to block federal and international action to control greenhouse gas emissions. It helped to erect a vast edifice of misinformation that stands to this day. This untold chapter in Exxon’s history, when one of the world’s largest energy companies worked to understand the damage caused by fossil fuels, stems from an eight-month investigation by InsideClimate News. ICN’s reporters interviewed former Exxon employees, scientists, and federal officials, and consulted hundreds of pages of internal Exxon documents, many of them written between 1977 and 1986, during the heyday of Exxon’s innovative climate research program. ICN combed through thousands of documents from archives including those held at the University of Texas-Austin, the Massachusetts Institute of Technology and the American Association for the Advancement of Science. The documents record budget requests, research priorities, and debates over findings, and reveal the arc of Exxon’s internal attitudes and work on climate and how much attention the results received. Of particular significance was a project launched in August 1979, when the company outfitted a supertanker with custom-made instruments. The project’s mission was to sample carbon dioxide in the air and ocean along a route from the Gulf of Mexico to the Persian Gulf. In 1980, Exxon assembled a team of climate modelers who investigated fundamental questions about the climate’s sensitivity to the buildup of carbon dioxide in the air. Working with university scientists and the U.S. Department of Energy, Exxon strove to be on the cutting edge of inquiry into what was then called the greenhouse effect. Exxon’s early determination to understand rising carbon dioxide levels grew out of a corporate culture of farsightedness, former employees said. They described a company that continuously examined risks to its bottom line, including environmental factors. In the 1970s, Exxon modeled its research division after Bell Labs, staffing it with highly accomplished scientists and engineers. At the outset of its climate investigations almost four decades ago, many Exxon executives, middle managers and scientists armed themselves with a sense of urgency and mission. His sentiment was echoed by Henry Shaw , the scientist leading the company’s nascent carbon dioxide research effort. Exxon budgeted more than $1 million over three years for the tanker project to measure how quickly the oceans were taking in CO2. It was a small fraction of Exxon Research’s annual $300 million budget, but the question the scientists tackled was one of the biggest uncertainties in climate science: how quickly could the deep oceans absorb atmospheric CO2? If Exxon could pinpoint the answer, it would know how long it had before CO2 accumulation in the atmosphere could force a transition away from fossil fuels. Exxon also hired scientists and mathematicians to develop better climate models and publish research results in peer-reviewed journals. By 1982, the company’s own scientists, collaborating with outside researchers, created rigorous climate models – computer programs that simulate the workings of the climate to assess the impact of emissions on global temperatures. They confirmed an emerging scientific consensus that warming could be even worse than Black had warned five years earlier. Between 1979 and 1982, Exxon researchers sampled carbon dioxide levels aboard the company’s Esso Atlantic tanker (shown here). Like others in the scientific community, Exxon researchers acknowledged the uncertainties surrounding many aspects of climate science, especially in the area of forecasting models. But they saw those uncertainties as questions they wanted to address, not an excuse to dismiss what was increasingly understood. When Exxon’s researchers confirmed information the company might find troubling, they did not sweep it under the rug. “Over the past several years a clear scientific consensus has emerged,” Cohen wrote in September 1982, reporting on Exxon’s own analysis of climate models. It was that a doubling of the carbon dioxide blanket in the atmosphere would produce average global warming of 3 degrees Celsius, plus or minus 1.5 degrees C (equal to 5 degrees Fahrenheit plus or minus 1.7 degrees F). Exxon followed his advice. Between 1983 and 1984, its researchers published their results in at least three peer-reviewed papers in Journal of the Atmospheric Sciences and an American Geophysical Union monograph. David, the head of Exxon Research, told a global warming conference  financed by Exxon in October 1982 that “few people doubt that the world has entered an energy transition away from dependence upon fossil fuels and toward some mix of renewable resources that will not pose problems of CO2 accumulation.” The only question, he said, was how fast this would happen. But the challenge did not daunt him. “I’m generally upbeat about the chances of coming through this most adventurous of all human experiments with the ecosystem,” David said. Exxon considered itself unique among corporations for its carbon dioxide and climate research. The company boasted in a January 1981 report, “Scoping Study on CO2,” that no other company appeared to be conducting similar in-house research into carbon dioxide, and it swiftly gained a reputation among outsiders for genuine expertise. In the early 1980s Exxon researchers often repeated that unbiased science would give it legitimacy in helping shape climate-related laws that would affect its profitability. Still, corporate executives remained cautious about what they told Exxon’s shareholders about global warming and the role petroleum played in causing it, a review of federal filings shows. The company did not elaborate on the carbon problem in annual reports filed with securities regulators during the height of its CO2 research. Nor did it mention in those filings that concern over CO2 was beginning to influence business decisions it was facing. Throughout the 1980s, the company was worried about developing an enormous gas field off the coast of Indonesia because of the vast amount of CO2 the unusual reservoir would release. Exxon was also concerned about reports that synthetic oil made from coal, tar sands and oil shales could significantly boost CO2 emissions. The company was banking on synfuels to meet growing demand for energy in the future, in a world it believed was running out of conventional oil. In the mid-1980s, after an unexpected oil glut caused prices to collapse, Exxon cut its staff deeply to save money, including many working on climate. But the climate change problem remained, and it was becoming a more prominent part of the political landscape. With alarm bells suddenly ringing, Exxon started financing efforts to amplify doubt about the state of climate science. Exxon helped to found and lead the Global Climate Coalition, an alliance of some of the world’s largest companies seeking to halt government efforts to curb fossil fuel emissions. Exxon used the American Petroleum Institute, right-wing think tanks, campaign contributions and its own lobbying to push a narrative that climate science was too uncertain to necessitate cuts in fossil fuel emissions. As the international community moved in 1997 to take a first step in curbing emissions with the Kyoto Protocol, Exxon’s chairman and CEO Lee Raymond  argued to stop it. “Let’s agree there’s a lot we really don’t know about how climate will change in the 21st century and beyond,” Raymond said in his speech before the World Petroleum Congress in Beijing in October 1997. Over the years, several Exxon scientists who had confirmed the climate consensus during its early research, including Cohen and David, took Raymond’s side, publishing views that ran contrary to the scientific mainstream. Exxon’s about-face on climate change earned the scorn of the scientific establishment it had once courted. In 2006, the Royal Society, the United Kingdom’s science academy, sent a harsh letter to Exxon accusing it of being “inaccurate and misleading” on the question of climate uncertainty. Bob Ward, the Academy’s senior manager for policy communication, demanded that Exxon stop giving money to dozens of organizations he said were actively distorting the science. In 2008, under mounting pressure from activist shareholders, the company announced it would end support for some prominent groups such as those Ward had identified. Still, the millions of dollars Exxon had spent since the 1990s on climate change deniers had long surpassed what it had once invested in its path-breaking climate science aboard the Esso Atlantic. Michael Mann, director of the Earth System Science Center at Pennsylvania State University, who has been a frequent target of climate deniers, said that inaction, just like actions, have consequences. When he recently spoke to InsideClimate News, he was unaware of this chapter in Exxon’s history. Delhi is getting its first hydropower plant, but it’s not harvesting the energy of running water in the traditional hydroelectric model, as this new system uses falling water from a treated sewage effluent pipe to spin its turbine. The new hydropower plant, in East Delhi, India, is built onto the Delhi Jal Board’s 9 MGD sewage treatment plant at Chilla, and is said to be the first of its kind, not only because it’s being powered by effluent water, but also because it’s the first hydropower plant in the city. According to the Delhi Jal Board (DJB), this pilot project was set up “free of cost,” and the estimated annual 20,000 kWh of electricity produced by the hydropower installation will be used directly at the sewage treatment plant. The treated effluent water falls from a height of 4.8 meters at the sewage treatment plant, which is sufficient to spin the turbine and generate clean electricity, and this ‘Green Power Generation’ energy technology will help to reduce both air pollution and electricity costs. No additional specs, other than the estimated 20,000 kWh of electricity annually, for the installation were available. According to DJB, the Board is also looking to replicate this hydropower setup at its other installations in the future. Today’s commercially available carbon-capture technology has proven to be extremely expensive and energy-intensive, nearly doubling the cost of electricity from a coal-fired power plant. FCE’s technology also increases the cost of electricity from coal-fired power plants, but the DOE believes that increase could be one-third or less. 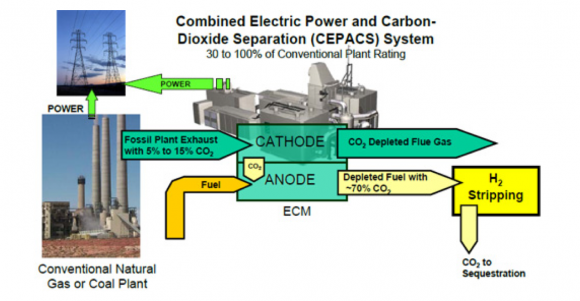 Even with these extra steps, Bottone said the fuel cell application is much more efficient than other carbon-capture technologies. Rather than drain productivity at the power plant, FCE’s technology generates additional power — and revenue — in exchange for the energy it consumes. A consortium of UK companies led by advanced waste to energy and fuels company, Advanced Plasma Power (APP), has today been awarded £11m in government funding to develop and build the first-ever plant of its kind which will turn waste from local homes and businesses into a sustainable fuel to power heavy goods vehicles. The grant has been awarded to APP and its partners National Grid, clean energy firm Progressive Energy, and CNG Services, a company which provides gas for use in vehicles, as part of a Department for Transport (DfT) programme to develop and commercialise the technologies required to decarbonise the transport sector. The new APP plant in Swindon will be the first of its kind in the world and take residual waste – the UK’s largest sustainable source of biomass – and convert it into compressed biomethane, using APP’s pioneering Gasplasma® technology and will produce enough fuel for 75 heavy goods vehicles, equivalent to all of the buses operating in Swindon. Biomethane can be used interchangeably with natural gas in heavy goods vehicles and is significantly less carbon-intensive and less polluting than diesel. It has the potential to cut transport carbon emissions by up to 96 per cent. Construction of the plant will begin in 2016 and the consortium has already found local customers for the product and suppliers for the feedstock. The post-recycling residual waste will be provided by a local source, and the gas produced will be used by local haulage company, Howard Tenens, and consortium partner CNG Services. The use of gas as a transport fuel is growing. John Lewis already uses it for some heavy goods vehicles, whilst some bus services operated in Reading and Sunderland also run on the fuel. The consortium has been working together over the last five years on a project to produce a renewable natural gas made from waste that can be pumped into the UK’s gas pipeline network which provides an excellent means of distributing the fuel to where it is needed. Transport Minister Andrew Jones announced news of the grant as part of £25 million awarded to winners of the Government’s Advanced Biofuels Demonstration Competition. “APP is delighted to have been selected in this competition by the DfT. It recognises our position at the very forefront of environmental and technical innovation in the UK. The grant also highlights the important role our technology can play in producing clean biofuels from waste on a local basis, so as to help reduce the greenhouse gas emissions from both the waste management as well as transport sectors without the requirement to give over large swathes of land to growing energy crops. From an economic, environmental and social perspective it presents a real triple win. “This is a great example of our commitment to innovative transport technology and supporting jobs and growth. Biofuels have an important role to play in keeping Britain moving forward in a sustainable and environmentally-friendly way. This £25 million is not only a vital investment in technology that will help secure a greener future but will also support the creation of thousands of jobs. “National Grid provides a gas network across much of the country and is proud to be part of this pioneering Department for Transport (DfT) programme to decarbonise transport. We believe that the use of renewable gas as a fuel in the transport sector will play a significant role in reducing greenhouse gas emissions in the future. The benefits of using household waste to create fuel for HGVs and busses is clear; lower emissions, quieter engine noise and favourable fuel prices. A green campaign to make the company pay for climate change is besieging the oil industry and its conservative allies. On Nov. 3, ExxonMobil dispatched its top lobbyists to Capitol Hill on an urgent mission — tamping down an escalating campaign aimed at making the country’s largest oil company pay a legal and political price for its role in warming the planet. The meeting marked a striking shift in Exxon’s handling of the controversy. The notion of holding oil companies responsible for global warming, in the same way tobacco companies had to pay billions of dollars in damages over the health effects of cigarettes, had long been seen as a quixotic quest led by scruffy, oil-hating extremists. But POLITICO’s interviews with dozens of activists, industry officials and lawmakers suggest that support for a legal crusade against Exxon is growing far beyond the political fringe — and now poses the biggest existential threat the company has faced in decades. Just five days before the meeting on Capitol Hill, Democratic presidential front-runner Hillary Clinton had urged the Justice Department to investigate whether the petroleum giant spent decades deceiving the public about the threat of climate change. State attorneys general had Exxon in their sights as well, preparing to issue subpoenas that would eventually rope in virtually all of Washington’s conservative policy apparatus. A four-year effort by green activists, scientists and lawyers to turn Big Oil’s biggest player into the poster child for climate change — deliberately patterned after the successful campaign to take down tobacco — was shaking the descendant of John D. Rockefeller’s Standard Oil empire to its core. So the four Exxon executives arrived at the office of California Democrat Rep. Ted Lieu with one job: convincing four of their most vocal congressional critics that the company wasn’t the polluting villain its enemies were making it out to be. Exxon supports “sound climate policy” and has tripled its greenhouse-gas cuts since 2008, the executives boasted to the lawmakers in a 10-page glossy presentation, later obtained by POLITICO. Exxon was even on record in favor of a tax on carbon emissions — a climate remedy more radical than anything President Barack Obama has proposed. The company left empty-handed, though, after refusing to directly answer questions about whether it had suppressed internal research that underscored the threat of climate change while publicly sowing doubt about climate science, according to people in the room. The presentation made at least one thing clear, however: After years of shrugging off pressure from eco-activists, Exxon was showing signs of worry. And Exxon wasn’t the only one with reasons to be nervous. Interviews with advocates on both sides of the feud reveal how quickly the anti-Exxon movement has sprouted, to the point that it’s now consuming op-ed pages, airwaves and courtrooms across the country. Once merely intent on shaming the oil giant into better behavior, environmentalists are pursuing a strategy to discredit the company, weaken it politically and perhaps make it pay the kinds of multibillion-dollar legal settlements that began hitting the tobacco industry in the 1990s. The campaign — led by some of the same climate activists who defied Beltway wisdom by killing the Keystone XL oil pipeline — has mushroomed into far more than a greens-versus-Exxon feud. Just last week, a leaked subpoena from the attorney general in the U.S. Virgin Islands revealed a vast probe that demanded Exxon’s communications with more than 100 free-market think tanks, conservative consulting firms and climate-skeptic scientists — proof, the company’s supporters say, that environmentalists are using the legal system to launch a broad attack on their political opponents. The subpoena targets Exxon’s dealings with parties including the Competitive Enterprise Institute, the U.S. Chamber of Commerce Foundation, the Hoover Institution, George Mason University and scientists at the Massachusetts Institute of Technology, the University of Alabama and the University of Delaware. The first subpoena to Exxon came from New York Attorney General Eric Schneiderman, who used his state’s powerful consumer fraud law to hit the company with legal papers just a day after the lobbyists’ meeting on the Hill. AGs in California and Massachusetts have also launched investigations into the company. Members of Congress have weighed in too, with Sen. Sheldon Whitehouse (D-R.I.) and presidential contender Sen. Bernie Sanders (I-Vt.) urging DOJ to consider bringing civil racketeering cases against oil companies. “Obviously, we take it extremely seriously,” Exxon spokesman Alan Jeffers told POLITICO, noting that the company is complying with the New York subpoena while it fights the racketeering summons from Virgin Islands Attorney General Claude Walker. The greens’ campaign is built on “distorted reports that they have commissioned and a distorted history of climate research that we’ve done openly with government bodies,” Jeffers added. Both sides describe the political stakes of the campaign as huge. Even rival oil companies that disdain Exxon’s support for a carbon tax are spooked about how far the greens’ campaign has gotten, especially when the industry is already reeling from a huge slump in fuel prices. Underscoring the industry’s anxiety is the breadth and intensity of the counterattack it has mounted. Industry consultants are accusing the state AGs of colluding with environmentalists, and have questioned the role of foundations created by the Rockefeller family — petroleum heirs turned anti-oil activists — in helping bankroll some news organizations’ Exxon investigations. The industry is even exploring the idea of launching a counter-probe: A lobbyist for one of Exxon’s industry rivals told POLITICO he has reached out to red-state attorneys general to gauge their interest in probing where environmental groups are getting their funding. No takers have emerged so far. Exxon itself has made similar arguments, fighting the Virgin Islands subpoenas in court as an infringement on the company’s free-speech rights. But Walker, the territory’s AG, dismissed that reasoning. The seeds of the Venus flytrap closing around Exxon were planted in June 2012 in the wealthy seaside town of La Jolla, Calif., where two dozen scientists, lawyers and academics huddled for a scholarly conference on an issue that had vexed the environmental movement for decades: How, on a planet filled with 7 billion people, do you hold oil companies liable for their role in worsening climate change? But attendees emerged with two strategies that would set the tone for today’s anti-Exxon fight. First, they underscored the importance of building a catalogue of peer-reviewed research making the case that individual corporations could be held responsible for their contributions to climate change, a step that could serve as Exhibit A in future legal action. That tactic took a page from Exxon itself, which funded research after its 1989 Valdez spill arguing that Alaska’s Prince William Sound was already recovering from the damage. Richard Heede, a climate researcher who helped organize the La Jolla conference, said the attendees realized the “value” of having credible peer-reviewed research. Working with other academics like Naomi Oreskes, whose book “Merchants of Doubt” drew parallels between the climate and tobacco fights, Heede published articles in peer-reviewed journals that placed the responsibility for climate change at the feet of major fossil fuel companies. In a November 2013 study, for example, Heede estimated that 63 percent of worldwide emissions of industrial carbon dioxide and methane came from a group of 90 “carbon major” entities. (ExxonMobil was prominent in the list.) Environmental groups like Greenpeace immediately trumpeted the research. Second, the La Jolla attendees agreed that obtaining and publicizing internal corporate documents was the key to turning public opinion against the oil companies and eventually securing a legal victory. Exxon’s opponents are likely to get hold of more internal records as the attorneys general proceed with their investigations. Schneiderman’s aides are culling through tens of thousands of pages of documents from the company, according to a person familiar with the probe. The source familiar with Schneiderman’s probe said the wide leeway afforded by his state’s financial fraud law, the Martin Act, aided his request for documents. Those include records of Exxon’s internal research into climate change’s causes, the role of climate information in business decisions, and marketing, advertising and company communications. From the start, Exxon’s critics drew heavily on the lengthy legal crusade against tobacco companies that culminated in a massive settlement in 1998 totaling hundreds of billions of dollars. Tobacco critics made little headway in the 1950s, when few Americans knew of the dangers of smoking. But the anti-tobacco fight gained steam as studies directly linked cigarettes to cancer and other ailments, eventually allowing the states to collect huge windfalls from the tobacco companies as compensation for smoking’s health costs. For the people gathered in La Jolla, even getting to the lawsuit stage would be a victory. “No matter what the outcome, litigation can offer an opportunity to inform the public,” anti-tobacco litigator Sharon Eubanks said at the meeting, according to the meeting notes. At the heart of any legal strategy is proof of a conspiracy or fraud — in this case, an alleged effort by oil companies to conceal their internal knowledge of their product’s contributions to climate change. The activists’ big break came in September and October, when the nonprofit investigative website InsideClimate News and the Los Angeles Times published stories alleging that Exxon’s scientists had known as far back as the 1970s that the company’s fossil fuels would cook the planet, even as its executives hid that knowledge. The stories, citing internal Exxon documents, didn’t make an immediate splash in Washington. Lieu and Rep. Mark DeSaulnier (D-Calif.) didn’t ask DOJ to launch an investigation until Oct. 15. Exxon addressed the controversy for the first time on Oct. 21, singling out InsideClimate as “an anti-oil and gas activist organization” — the first of many times that the industry would slam the news outlet for taking money from the anti-fossil-fuel Rockefeller Brothers Fund and Rockefeller Family Fund. Days later, Exxon’s lobbyists were taking the meeting in Lieu’s office with Lieu, DeSaulnier and two other liberal House Democrats. They aimed to “show the source documents that we think are the complete opposite of what the media reports have showed,” Exxon spokesman Jeffers said afterward. But when Lieu asked if Exxon supported any current proposal to tax the carbon in its nearly 25 billion barrels in proved worldwide oil reserves, the lobbyists said no. Nor would the company admit to the greens’ accusations of deceiving the public. American oil companies are coping with the anti-Exxon campaign at a uniquely vulnerable time, with oil prices dropping to a 13-year low in February. Exxon lost its top-ranked credit rating last month thanks to a debt load that has more than tripled since 2012 and earnings that fell by 50 percent last year. To be sure, Exxon’s status as one of the world’s most profitable companies remains unshaken. Its market value is nearly double that of Chevron, the nation’s second-biggest oil and gas company. But as the greens’ campaign matures, Washington’s conservative firmament is broadcasting its fury at what it sees as a fishing expedition aimed at ferreting out embarrassing information about the company. conference in March with former Vice President Al Gore. Two BakerHostetler litigators, David Rivkin and Andrew Grossman, have also founded a project called Free Speech in Science accusing the environmentalists of attacking climate skeptics’ constitutional rights. Leaders of the Federalist Society, an alliance of conservative lawyers that counts Supreme Court Justices Clarence Thomas and Samuel Alito as members, have penned lengthy attacks on Schneiderman and other attorneys general investigating Exxon. National Review, Reason, Powerline and others followed suit in defending the oil giant, as have members of The Wall Street Journal’s editorial board. Exxon is “considering all of our options” for potential legal action against InsideClimate News, the Los Angeles Times or activist groups, spokesman Jeffers told POLITICO. Aside from the company itself, the most vocal resistance to the greens has come from FTI Consulting, a firm filled with former Republican aides that has helped unify the GOP in defense of fossil fuels. Under the banner of Energy in Depth, a project it runs for the Independent Petroleum Association of America, FTI has peppered reporters with emails that suggest “collusion” between green activists and state AGs, and has raised questions over InsideClimate’s Rockefeller grants. InsideClimate News, which was named a Pulitzer Prize finalist last month for its Exxon stories, says it has received $25,000 from the Rockefeller Family Fund, or about 2 percent of the company’s budget. The idea that the funding is influencing its news coverage is “an easy accusation, but it’s completely baseless,” founder and publisher David Sassoon told POLITICO. While nearly 200 nations hammered out a global climate agreement in Paris in December, many establishment environmentalists took a victory lap. But the anti-Exxon forces were girding for their next fight. On the sidelines of the United Nations conference in Paris, Pawa — the Massachusetts lawyer — delivered a private talk to activists that McKibben described as his “opening argument in the case” against Exxon. Columbia Law School professor Michael Gerrard also spoke that day at Pawa’s request about what he described as “some of the defenses that would be raised” by a corporation facing legal threats linked to its greenhouse gas emissions. Pawa is a veteran Exxon antagonist, having won a $236 million judgment against Exxon in 2013 for polluting New Hampshire’s groundwater. He helped an Alaskan Inuit village sue the company in 2008 over the rising seas that threatened the local economy. And the previously unreported closed-door huddle in Paris wasn’t the only place Pawa has touted his legal theory of Exxon’s culpability. He delivered a courtroom-style presentation titled “What Exxon Knew About Global Warming, and What it Did Anyway” in March at an environmental law conference in Oregon. Later that month, he led a closed-door briefing with Democratic attorneys general and their staff, according to emails obtained by Horner’s conservative think tank. Pawa’s central role in the escalating bombardment of Exxon has made him a target, as the company’s allies liken him to a puppet master orchestrating the campaign behind the scenes. But he told POLITICO that he is not formally involved in any state investigations, even as he suggested that more AGs could jump into the fray. Activists plan to make a public stand at Exxon’s annual shareholder meeting May 25, where several resolutions intended to force the company into acknowledging the climate threat will come to a vote. The calls for a DOJ racketeering investigation from Clinton, Sanders, Lieu and Whitehouse, a former state attorney general, are also paying off. The Justice Department told Lieu in March that it had referred the requests to the FBI, a move that doesn’t preclude DOJ later filing a civil complaint. Oil companies may face yet another headache if Democrats regain the Senate in November: Lawmakers such as Whitehouse told POLITICO they will push to hold hearings like those in the 1990s where tobacco executives had to testify under oath. The prospect of intensifying political trouble for Exxon and other major oil companies while a legal case drags on is an integral design feature of activists’ campaign against the company. Whether the endgame is the type of multibillion-dollar settlement that crippled cigarette makers, or whether it’s a Beltway surrender that forces the company to do more on climate change, no longer matters. What matters, the company’s critics say, is sending a message to the industry that its days of climate obstructionism are over. In the meantime, Whitehouse is betting that the flood of internal Exxon documents emerging as a result of the investigations will uncover damaging information. “It wouldn’t surprise me if some of these organizations were busily scrubbing their files to get rid of culpatory materials,” he said. Meanwhile, the industry’s seemingly united pro-Exxon front belies a paradox: Other American oil companies are frustrated by the company’s stated advocacy of a “revenue-neutral” carbon tax. No Democrat or environmentalist takes that stance seriously, but Exxon’s willingness to even utter the phrase makes it an outlier among U.S. drillers and refiners, which fear that a levy on greenhouse gases could gain momentum if Clinton wins in November. Many in the industry are also skeptical of Exxon’s ties to the Democratic front-runner: The company’s Washington office includes senior lobbyist Theresa Fariello, who bundles contributions for Clinton’s campaign, and former Democratic aide Dan Easley, both of whom attended the Election Day meeting in Lieu’s office. 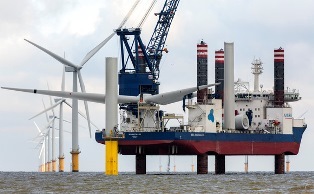 A recently completed pile testing campaign by DONG Energy and ESG shows cost reduction potential for the offshore wind industry. The piles under test are made of a cylindrical steel tube and their depth is adjustable to suit environmental and seabed conditions. The piles are one of the most commonly used foundations in the offshore wind market based on ease of installation in a variety of water depths. The two testing sites, located in Cowden, England, and in Dunkirk, France, carried out tests on 28 piles. The purpose was to assess and validate new design methods development by a joint industry project PISA (pile soil analysis) for offshore wind farms. The PISA academic working group included Oxford University, Imperial College London and University College Dublin. The group supervised testing as the 28 piles were pulled sideways into the soil until failure occurred. The two test sites involved feature diverse soils—clay till in Cowden and dense sand in Dunkirk, representative of surface soil conditions in the North Sea. Previous oil and gas engineering pile testing at both sites provided field and laboratory soil data. Results confirm that traditional design methods are conservative and that by reducing the quantity of steel in the foundation it may potentially reduce electricity production costs. The testing was undertaken as part of the PISA research project and carried out by industry working group headed by DONG Energy including EDF, RWE, Statoil, Statkraft, SSE, Scottish Power, Vattenfall, Alstom and Van Oord. PISA operates under the framework of the Carbon Trust Offshore Wind Accelerator (OWA). The PISA academic working group will analyze the data and deliver a final report to project partners in early 2016. A project involving the use of “mutagenised tobacco” for aviation fuel, supported by South African Airways, Boeing and SkyNRG this week got the thumbs up from the leading global sustainability authority. Project Solaris has been recognised by the Roundtable on Sustainable Biomaterials (RSB), which has been identified by the World Wildlife Fund and other leading international NGOs as the “strongest sustainability guarantee on the market”. Member organisations of RSB, an independent, global multistakeholder coalition working to promote the sustainability of biomaterials, include Boeing, Airbus and the international Air Transport Association. Maarten van Dijk, SkyNRG’s CEO, said RSB’s certification of the Solaris project is an important milestone for the company and for the aviation industry in general. Italian research and development enterprise Sunchem Holding owns the patent for “energy tobacco”, under which Solaris is the first seed to have been developed. The patent has been granted in 110 countries. Sunchem Holding chief executive officer Sergio Tommasini told ANA the company was also exploring options for production in Malawi and Zimbabwe. The project has the potential to leverage the knowledge and experience of established traditional tobacco farmers, although it is not necessary to have the same climate conditions because Solaris can be cultivated under various conditions, said Tommasini. Nonetheless, a project like this depends on a lot more than the weather, including trustworthy partners with imagination, which the company has found in South Africa. Tommasini told ANA that, in South Africa, Sunchem had “found very solid partners, and in general it is the country that more than others (Brazil, Bulgaria, North Carolina) has embraced our vision and grasped its potential, considering especially the social impact that growing energetic tobacco could generate if applied on a large scale”. The Solaris tobacco plant is free of nicotine and GMOs and maximises the production of flowers and seeds at the expense of leaves. The seed is about 40% oil and subjected to mechanical pressure about 34% of the seed oil can be extracted. This is more than double the yield from rapeseed, soy or sunflower. What is left, being free from nicotine, can be used in fodder for animals. The project, which uses a mix of commercial farmers and smallholders, has brought economic and rural development to the Limpopo province, but questions will be asked about using arable land to produce fuel for aeroplanes. “Developing a biofuel crop in South Africa’s ‘breadbasket’ province has of course drawn us into the centre of the food versus fuel debate,” said Sunchem South Africa’s managing director Joost van Lier. SAA said it was a proud member of the RSB. “SAA is a proud member of the RSB and subscribes to the environmental and social sustainability principles enshrined in the RSB standard. This certification ensures that future fuels contribute to reductions in CO₂ and are environmentally sustainable and contribute social and economic benefits to our rural economy where it is needed most,” the group’s environmental specialist Ian Cruickshank said.